Product information "SEGGER 8.06.05 - 10-Pin Needle Adapter"
mating connector or programming header. The designed pattern with 3 locating pins ensures, that the adapter can not be connected the wrong way. The Needle Adapter allows manufacturers to save costs and space on their PCBs since there is no need to provide the PCB with additional connectors. It adapts frThe 10-Pin Needle Adapter has been designed to connect the Flasher to a PCB which does not come with a om the 10-pin 0.1 inch to a 10-pin needle connector. Does NOT include 20-Pin to 10-Pin Adapter Board. 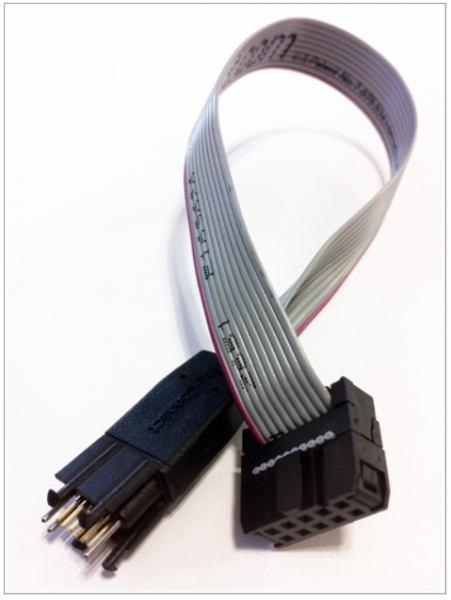 Please refer to the J-Link Needle Adapter (8.06.04) if the 20-Pin to 10-Pin Adapter Board is required for your application. Related links to "SEGGER 8.06.05 - 10-Pin Needle Adapter"
Customer evaluation for "SEGGER 8.06.05 - 10-Pin Needle Adapter"